Shailaja Nagaraja was born and brought up in the city of Bangalore. Her maternal grandparents and the rest of the family came into the Sai fold in the 1970s. Shailaja comes from a family of three girls. Among her siblings and across her extended family, someone or the other has been a student of the Sai educational institutions for most part of the 33-year-period, spanning 1977 to 2010. 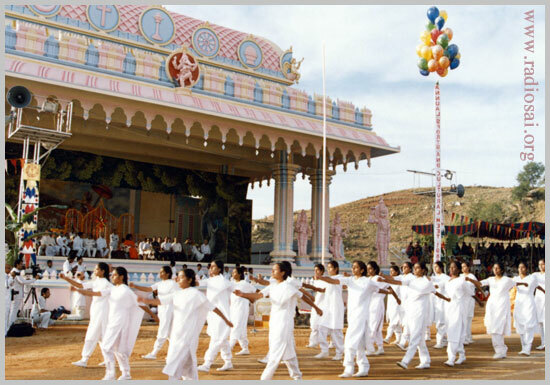 M. N. Shailaja, as she was known then, joined the Sri Sathya Sai Arts and Science College in Anantapur in 1983. She completed her intermediate studies by 1985. Thereafter, she joined her undergraduate programme at the Sri Sathya Sai Institute of Higher Learning and completed her B. Sc. in Home Science in 1988. Subsequently, she pursued her post-graduate studies in Psychology from Chennai’s Annamalai University. Shailaja after her studies, followed a rather unlikely career path. In 1992, she began with a sales and marketing job in Bangalore and by 1998, she moved on to operations for a corporate help desk in Bangalore. In 2002, she joined America Online or AOL in Bangalore as the Service Delivery Manager and rose to the position of Director, Operations. Thereafter, she joined Aegis BPO as Vice-President, Operations, for South India and Sri Lanka. 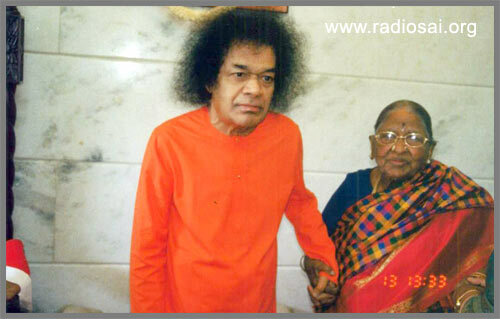 Shailaja comes from a family with inter-generational connection with Bhagawan Sri Sathya Sai Baba. Nicknamed the Chettiar family by Bhagawan, Shailaja Nagaraja has enjoyed profuse Sai blessings since her early childhood. Radio Sai is pleased to bring you excerpts of Shailaja Nagaraja’s conversation with Radio Sai’s Karuna Munshi which was recorded for our radio series, Fleeting Moments, Lasting Memories, in January 2011. RS: Your family has been coming to Bhagawan Baba for about 40 years now. How is it that Baba insists you have been devotees for 60 years? The math doesn’t add up. RS: What was it like to have known Swami then, that is, in the ’70s? Could you share some of your family’s experiences from those days? SN: Swami used to be in Whitefield very often. And, mom would take all of us by train to Whitefield. Grandma would, of course, be there. We used to have lovely darshans. Probably the first experience for our family came when dad was in his middle age (he was an asthmatic patient and used to be very sick). It was then that Swami came in mom’s dream, gave her the address of a house and told her, “Go there”. 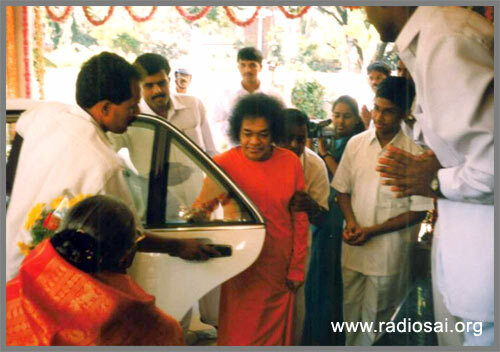 The address that Swami had provided was in Malleswaram, a suburb in Bangalore. On a Sunday, my mother took all of us and went to that house. When she knocked on the door, a man said, “Please come. I’m waiting for you.” He gave mom a rudraksha (holy bead) and said, “Let your husband take the teertham (the holy water) of the rudraksha on a daily basis and make sure he wears the rudraksha around his neck.” As instructed, he offers prayers to the rudraksha every day, does the abishekam to the rudraksha and drinks the holy water. The rudraksha around his neck continues to protect him. RS: How is his health now? SN: It does fluctuate now and then, but Swami is there and takes care of him continuously. And at any given point of time, when needed Swami has always blessed him either through vibhuti or with darshan and takes care of him. Apart from my father, Swami has been there for me as well. In 1988, when I graduated and attended the convocation, I couldn’t see with one eye. I had lost vision in that eye all of a sudden. RS: No stye, no infection? SN: I too thought it was a stye that couldn’t be seen from the outside, but I had no vision. After the convocation, when I went back to Bangalore and consulted the doctor, I was told that it was an inflammation of the optic nerves and was put on steroids. After nearly a month on this treatment, my vision returned and I was perfectly fine. He also instructed me to stop all other medicines right away and take lots of Vitamin A. I was on 60mg of Wysolin, a steroid, on a daily basis (I did stop all medicines that same day). Swami then asked, “What do you want to do now?” He was referring to my plans after graduation. RS: But you meant Indian Administrative Services, which is a competitive exam. RS: On the spot eye test? SN: That’s right. He would look deeply into my eyes and over a week’s time, my vision was completely restored. I’ve never had a severe headache or the need to wear spectacles ever since. 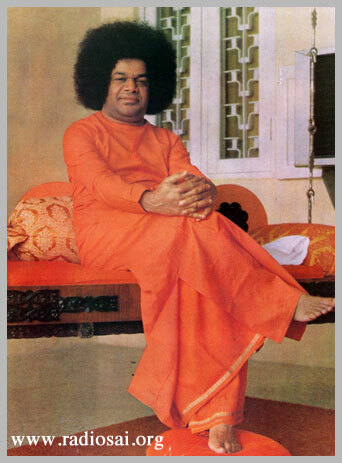 I believe its Swami’s grace that I can see and read today. I am fortunate I can have His darshan with both eyes. RS: Just His word brought back your vision! RS: Three generations of your family live under the same roof. How does this work? Is there a lot of interpersonal relations at work? 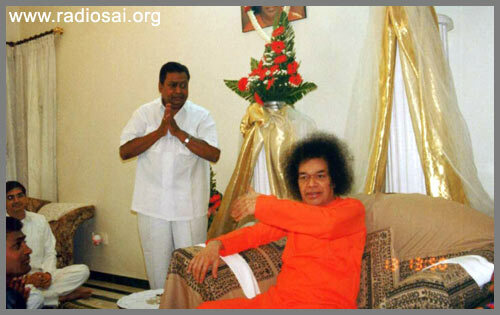 SN: It is Swami’s grace that has brought us together. He told grandma, “Keep all your children with you.” He wanted us all to stay together. And, I think that’s exactly what binds us and keeps us together. We do have a few ups and downs like any normal family but no major concerns. We live together and none of us would ever do anything that makes Swami unhappy or disappoints Him. He is like the head of our family. RS: Your grandmother enjoyed a warm relationship with Swami. Tell us about her rapport with Swami. SN: Grandmother was a very, very simple woman. In her simplicity, she would speak or ask Swami whatever was in her heart. In the ’80s, when my uncle was to get married, he was very stubborn that Swami should perform the marriage. He refused to have it any other way and even threatened that he would remain unmarried if Swami did not oversee his wedding. Worried that he might carry out his word, my grandmother was restless about the huge pressure she would have to face from the extended family on why her son was not getting married. He allowed us to invite the entire extended family. This gave, everyone the opportunity to witness Swami perform that marriage. RS: Although you come from a traditional Hindu family, this was not the only time that Swami overruled the convention of horoscope, isn’t it? SN: When my sister was to be married, Swami asked us to get a few horoscopes. He selected one among them and said, “Go ahead with this.” He performed her marriage too. Both the marriages were performed by Him with no horoscopes but it was His divine vision that chose them. RS: Meaning ‘Give me Your word’? SN: “Give me Your word, Swami, that You will take care of all my children.” Anyone else would have been a little apprehensive to say something like that to Swami. But, she always spoke her mind. That was how simple she was. When she asked that Swami take care of her children, He said, “I will always look after them.” And truly, I don’t think there’s been a day, a moment, a second when He hasn’t been looking after us. He has been guiding us through every single step. 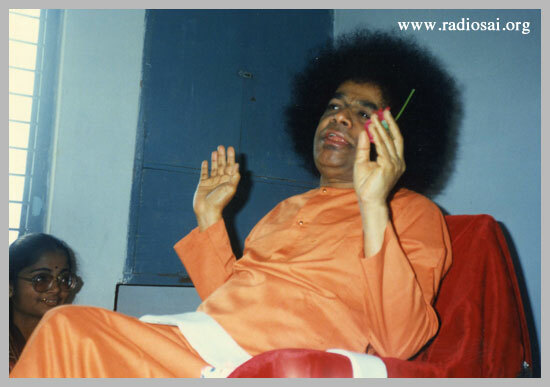 RS: Having Swami, the Living God, as the head of your family, there must have been many occasions when He would have participated in your family celebrations, apart from the two weddings. Would you like to share some? SN: Right from the marriages, the aksharabhyaasams (initiation into learning) for all of us, the upanayanams (thread initiation) or the 60th birthdays, He has always been a part of every occasion. He made sure we never felt a lack of celebration and He would always be there to mark all auspicious days with us. We could not ask for more. We really could not ask for more. RS: In light of how busy Swami is and the huge crowds around Him, how do you reconcile to the distance from His physical form? SN: Our grandmother would always tell us that regardless of whether Swami looks at you or not, talks to you or not, we should have complete faith that He is the one guiding every decision of ours. And even to date, He guides us. He gives us signs about what is to be done or what is not to be done, every single step of the way; I cannot think of any major decision that has been taken without His permission. RS: But if you were not able to approach Him personally? SN: He would communicate that to uncle or someone from the family. He will ensure that His message reaches us. 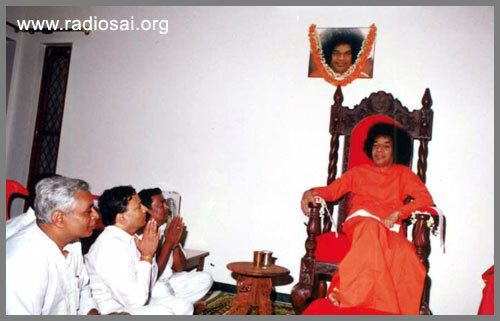 RS: Swami has visited your house many times in Bangalore. What is it like to play host to God? SN: It’s the most wonderful experience. The first time He visited us, we were living in a house that was within a little alley. A car could not really come and stop right at the doorstep. All of us were very worried that He would have to walk at least 50 yards to come into the house. 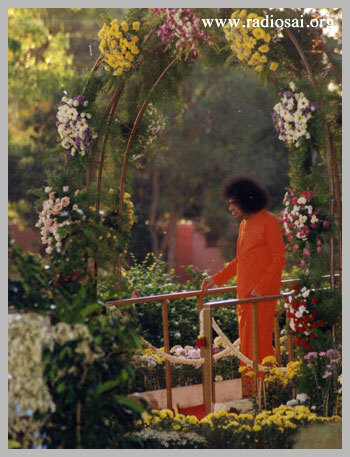 But, Swami got down at the corner and walked that distance without any fuss as if He was coming to His own home. And, when He stepped out after the one hour that He spent with us, the entire street was packed with people. But Swami never showed even a sign of irritation or anything. He stood on the edge of the car so He would be visible and blessed everybody and then got into the car and left. After some years, He asked us to construct a new house and said, “I will come there. You build the house and I will come.” We followed his instruction and constructed the house. But, we did not move in and had to wait for almost three years before He finally visited us. And that too happened in the most sudden manner. While we were at Whitefield one day, He said, “Tomorrow, I will come to your house.” So, overnight, we opened up the house and got the whole place ready. Swami came the next morning and blessed the house. It was a sort of housewarming for us and that was when we moved into the new house upon His instruction. RS: And that was not the only time that He visited? SN: He’s visited us a number of times. And, each visit would be an experience you treasure all your life. He would speak to every single member of the family and spend quality time with grandma. Watching Swami and grandma talk would seem like two old friends talking. It is such moments that you cherish all your life. RS: What kind of things would Swami talk to the family members during these visits? Then, He would reply, “No, you tell me what you want me to speak about”. It would go on like this for two minutes and then He would start speaking. It could be philosophical, spiritual, something about the happenings in the world or about the way of life, but He would dwell on every topic for at least four or five minutes after which He would talk to everybody individually or as a group and then of course, He would have lunch and take His leave. SN: Those are the moments that give us much strength today; you don’t even realize what you’ve had until you don’t have them at all. RS: Are there any moments or any particular piece of advice from one of those visits that comes to mind? SN: There are many moments, his word was always final. He would tell us what to do when it came to admission into colleges, schools, or anything for that matter. To my younger sister, He once said, “Change from science to commerce.” And she followed His word. She had done her Intermediate in science and for her graduation, she switched to Commerce. And today, she is a Chartered Accountant. RS: So, you never questioned when Swami said, “Change from science”. RS: She had no ambitions to pursue a career in science? Originally? SN: Well, she must have had some plans. But Swami said, “Commerce” so, she changed to commerce immediately. The other thing that comes to my mind is about my mother who used to be worried about my younger sister and me not being married. Swami said, “They’re working, they are happy. So, be happy.” And I don’t think mom has worried about us after that. RS: Isn’t it rather unconventional for a traditional family like yours to have two of the women working and single. Was Swami fine with that? SN: Yes, Swami was fine with it. Once we got Him to approve of our decision, everyone else let go of their initial reservations and accepted His will. RS: Coming to your student life at Anantapur, what was it like? SN: Those were great moments. During my first year of college, equivalent to XI grade today, what you remember more than anything are Swami’s visits; He visited our hostel thrice. The passion and the energy, when you’re getting ready for Swami’s visit, has to be seen or experienced to know what it feels like. On His first visit, He came in the morning and left in the evening. Every single moment, His walk through those corridors and the prayer hall, His conversations with all of us or the plays that we would put up for Him, every single moment is something that you cherish. And each of those visits left behind in you a desire for more. And, leaves in you a desire to do all that you think would get you more such opportunities. So, you want to pray more, do service, etc.. Because He leaves you with that feeling. You know, it’s like that amrit (elixir). You’re never satisfied. You just want more and more and more. And of course, we would look forward to coming to Parthi every weekend. RS: I believe there were occasions when as a student you ran into law and order issues in Swami’s hostel? At just 4 o’ clock, the power goes off in the university building and we were all called in as a group for the interview. We were around 10 or 11 in that group. We were the old students who had just finished 12th in Anantapur College. The interviews for students coming from outside or entering degree college alone had finished by then. Our warden looked at the two of us – a friend of mine and I, both partners in many a crime back at the hostel, and told the other panel members, “They’re very naughty but have promised me they will be very good.” On our part, we assured them of impeccable conduct and managed to secure admission into the graduate programme. I would call that nothing but Swami’s grace. We just did not expect it to be so easy. These are the little things that make you realize that He’s always there for you. 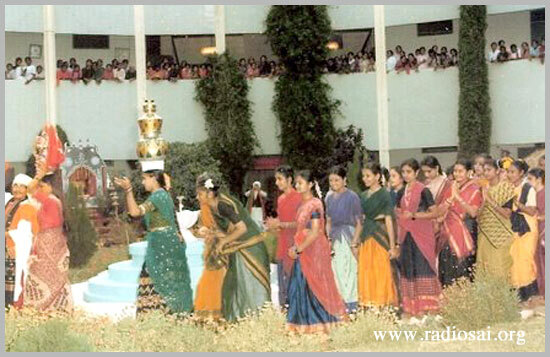 RS: And then, during your under graduate time at Anantapur, were there any highlights you’d like to share? SN: During the Sports Meets, Swami would come to watch us during the rehearsals. I was not leading the group in the march past. 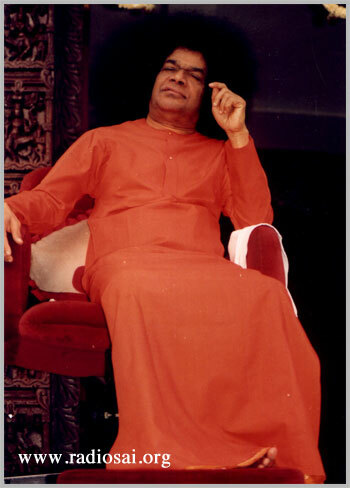 But during one of those rehearsals, I had a small prayer in my mind saying, “I wish I was leading one of the groups during the march past.” And, when Swami came in to watch a practice session, suddenly He said He would like to see the march past. And, I actually ended up leading the team that I was walking with. It happened just like that. RS: You were a make-shift leader? SN: I was a makeshift leader for that one moment. But I did it in front of Swami. That makes up for everything. That is His grace, you know. He fulfills the little desires that you may have. RS: It confirms your faith even more. SN: Yes. And then, here are times when you think of something or you’ve said something and He knows every thought of yours, good or bad. And He still loves you unconditionally. Only divinity can love you like that, unconditionally. RS: Imagine if we all could read each other’s thoughts. SN: We would end up killing each other! RS: Possibly. Everybody would be at war within families, within workplaces. But Swami knows each one of our thoughts and emotions, our innermost feelings. And yet, He loves us so unconditionally. SN: Only God can do that, nobody else. This reminds of the time when my aunt and I were sitting in the darshan line and I told her, “Yesterday, He looked a little old, didn’t He?” I suppose that came from my youthful arrogance! My aunt just replied, “Haan (yes), maybe.” When Swami came out for darshan, He walked across to the arch we were sitting in and said to no one in particular, “Aravai yelu aayindi kadhaa? It’s 60 years, isn’t it?” I had no doubt that His words were in response to the comment I made as Swami was over 60 years old then. With shocked expressions, my aunt and I looked at each other and we were like, “Oh my God!” You know, He made that comment so nonchalantly and walked away leaving little doubt that He knows every single comment you make in your mind or otherwise. Yet another time when my aunt and sister were sitting for darshan, Swami came. Usually, it’s normal for all devotees to pray for something or the other as He passes you by. On this occasion, just as Swami passed, He left tulsi leaves behind from His feet that were very noticeable on the clean floor. People picked them up and my aunt gave the one she picked to a cancer patient sitting next to her. So, those are the little miracles that He does that leave you in utter bliss. RS: How did the five years at Anantapur College impact you as a person? SN: I think when you study in a hostel, it teaches you to be a lot more independent. RS: That could be true of any hostel. RS: So, what about Swami’s hostel? What was different about it? SN: Being together, working together and praying together, I think that makes a huge difference; because when you pray together and stay together, you work as a team. No achievement is the success of one person. It’s everybody’s success. In the hostel, all of us are assigned duties that teach you to not only take on responsibilities at a very young age but also do a good job in carrying them out. I think you take away all of those learning’s with you as well as Swami’s abundant love. I would also say that the most important difference is that He is there, every single moment with you. The assurance that He will never let you be alone any moment, that He is taking care, He knows every thought of yours, that He is watching you and will never let you down gives you a confidence that nothing else can. RS: You have obviously enjoyed considerable professional success in your life. How do you attribute it to the education you have received? You spoke about the team spirit that you imbibed there, which you carried and extended into your work life. What else did you take with you? SN: Perseverance and belief that Swami will help you succeed. Give it your best and do not worry about the results. In my first job in sales and marketing, I think for almost 60 days, I never had a single sale come my way. I was almost ready to resign, thinking maybe this is not the kind of job I should be doing. RS: Very disappointing, isn’t it? SN: Very! And when it is your first job, you want to be successful, you want to make Swami proud of you, you want to make your parents proud of you and you’re wondering, “Oh my God! What’s happening?” And I was just praying to Swami, I said, “Maybe it’s time for me to leave and I should not be in this profession.” I was selling time share resorts. On a particular day, when I had the strongest urge to resign and thinking to myself “Swami, this is not what I should be doing”, I got three sales on that one day. It seemed like all the effort of the past paid off on that day. I don’t think I’ve ever looked back since then. So, the point is, just go out, do your very best and be straight. You don’t have to play the games; you don’t have to be political. Just do your honest work and pray that Swami is always there to take care of you. He will ensure that whatever you deserve is what you will get. We will never go through an experience without some learning in it. RS: Does that mean unpleasant experiences also have a lesson to convey? SN: Very much. It’s like when you have a bad boss, you learn what not to do while from a good boss you learn what to do. There is learning in both situations, whether it’s a to-do or a not-to-do lesson. Swami makes you go through such experiences as He thinks it’s important for you to imbibe them. So, if Swami chooses for something to happen to you, just pray that He gives you the strength to go through that experience with a positive frame of mind. RS: And, do you find your answers? SN: Most of the time, yes. And then you realize its okay to go through all those challenges if you have learnt something out of it. While hindsight is always 20:20 it is very difficult when you are going through that learning. During such times knowing Swami is with you and will take care of you and not allow anything wrong to happen to you is the biggest positive knowledge that can help you go through from one day to the next. RS: As Vice-President of a multinational company, I’m sure you are required to network and socialise, how did that gel with the background you come from? More so because the value set that you carried from the Sai University are not necessarily in sync with that culture? SN: Corporate culture teaches you a lot of things that you don’t need to know and I never felt the need to do any of those in order to feel at one with the group that I was with. RS: Were you not at a disadvantage? SN: Not at all. You are respected for who you are. And I don’t think you need to make it an issue. If you say, you’re ‘high on life’ as I normally do, you don’t need a drink to get there, and they begin to accept that. Swami’s love gives you that strength to be able to say no to things without feeling like you’re missing out on anything. And truly, I don’t think you are. It doesn’t affect you. And, when they respect you for who you are, they stop pressurizing. So, while you can still have a conversation with them, go out, meet them socially, you don’t have to do things that they think is what should be done. There is absolutely no need to compromise on your value systems at all. RS: But, doesn’t that give you that ‘holier-than-thou’ attitude in the eyes of your colleagues? SN: Not at all. I think there are many good people out there and I think we’ve had the extra fortune of knowing Swami. And it doesn’t matter whether you’re out there succumbing to social pressures to smoke or drink or not doing it. It doesn’t make you feel superior in any way. At the same time not being the life-of-the-party socialite doesn’t make you feel inferior either. When you’re doing your networking, you need to keep an objective view. Staying balanced and true to oneself is important. RS: And as far as I can read, it all comes from a place of self-confidence that Swami instills. SN: Swami gives that to us saying “Just be yourself.” You don’t have to compromise on anything. RS: If you say, “I just have to be myself”, who is that yourself? SN: Swami says, “You are the children of God. Just remember that God is with you at all points of time in every decision that you make, in every move that you make. Be sure about what you’re doing because you can’t do anything without His will.” We should remember that, that is what drives me. RS: And violating Sai’s expectation would be detrimental to being a child of God. SN: Yes. Enjoying Divine Privileges as a Child of God. RS: So, growing up in a Sai family, you received the Sai education. At the end of the day, what is your most precious takeaway from this experience, if I asked you to sum up? SN: I think the fact that Swami’s with you at every point of time, that He takes care of you. So yes, it is omnipresence. Let me give you another example: When my mom had a burst appendix, the doctors weren’t confident of the surgery and felt she would not survive it. She was in the operating theatre when she saw Swami’s face and felt Him sort of rubbing that stomach where the surgery was to take place. And the surgery was a success that surprised even the doctors. They least expected it to be so. Even when grandpa went through almost six heart attacks, everyone felt he had actually passed away for a few moments during one of them. All of us kept saying ‘Sairam Sairam Sairam’ loudly. And, he came back. RS: And your grandfather lived a full life? SN: And grandfather lived a full life. He passed away when he was 96. RS: Six heart attacks later! SN: Six heart attacks. And you don’t survive them so easily. Typically, it’s three. So, every single second that He has given us has been His grace. We’re just grateful. RS: And, this gratitude runs through all generations? SN: The sense of gratitude runs through every single member in the family. Swami has taken care of every minute detail. For instance, when my sister was having her child, He said, “No operation” and she went through 18 hours of labour before the baby was born. He named that child Ratnakar and even did the aksharabhyaas for him. When my cousin sister had a baby, she had high blood pressure throughout her pregnancy. The doctors were very worried because her BP would not come down. Two months before the baby was born, Swami came in my aunt’s dream and she could see a baby’s head being pressed by Swami. And when the baby was born, He gave the baby to another lady and said, “Now, give it to her (my aunt).” And in her dream aunty took the baby in her arms. Two months later, when the baby was born and brought out of the operation theater, my aunt realised that the baby exactly resembled the one she saw in her dream. What more indication do we need to know that He is there with us every single moment ? RS: And, He had taken care of the baby in the seventh month of pregnancy itself. SN: That’s right. I can also recall the instance when my other aunt was suspected of cancer and Swami said, “Adi cancer kaadhu, TB” (It’s not cancer, its tuberculosis). And then, she was treated for TB and she has recovered completely and is perfectly fine. RS: So, you had your own divine doctor to consult. SN: Seriously! And there was another time when during an interview, Swami created a chain and put it around my uncle. During those times, Swami would Himself fasten the chain. But at that point of time, He just kept His hand there for almost 10-30 seconds. All of us watching this marveled at Swami’s act. A week later, uncle was down with severe jaundice and had to be admitted in the hospital. At that time, it dawned on us that Swami had put His raksha (protection) around uncle’s neck that helped him recover from that. So, He’s been there every single moment, every single day. I can’t think of a time when He has not been there. So, we did not do anything. RS: No shraardh rituals and pujas, no obsequies, nothing? SN: Swami said she doesn’t need it. And He had told her much before she passed away that she would not have any more janams (births). RS: So, she went straight to infinity? SN: That’s right. Merged into His Lotus feet. Even till date, other than the Narayan seva, there are no other rituals that are performed. 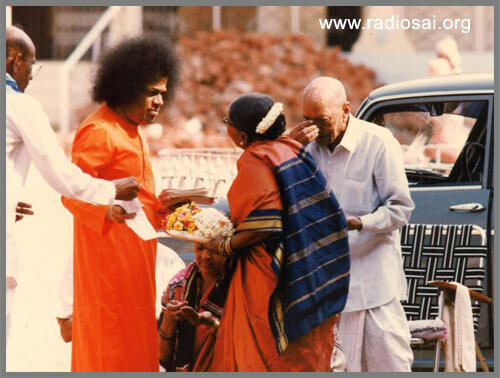 And, during those three days after her death, Swami sent home the food we were to eat. I also remember another occasion when He told my uncle, “Do not start this business.” We did not give heed His word and went ahead. And, of course we lost a lot of money. When we push Him, He might say yes for our sake, for our happiness, but He will tell us once - about what is right for us. So the first time he says something, we should just listen.That once is enough. RS: Your story is very unusual because very few people can even imagine or relate to having such a vivid presence of Swami as a family member. When you look back, what do you count as your greatest blessing? RS: What does it mean to you? SN: You feel it in every step that you take. You know He’s going to be there for you. And today if we are together as a family, I think it’s His grace; it’s His love that keeps us all here. I think this is true in anyone’s life, we feel His love in every single moment. RS: What if something not so welcoming happened? How would you interpret that? It would be easier to handle it. SN: What are your fondest memories of the Whitefield years? The darshans at Whitefield were always amazing. It was as if Puttaparthi was His corporate headquarters and Whitefield was His summer holiday home. You could see Him walking, talking, and playing with the animals there. Those are memories that you cherish, the Trayee sessions or the summer courses that used to happen in Whitefield, I think every one of those experiences, that you grew up with are memories to cherish. We couldn’t have asked for more. RS: There have been sad occasions in the family but you’ve all come through together as one, like your uncle passing away. RS: Your grandma was referring to her daughter? SN: Yes, my aunt. And, He said, “Nen undaanu kaadhaa? Am I not there? I’m in that photo, remember?” This was a photo of Swami at home where Grandma always felt His expressions changing. So, He referred to that photo and said “I’m there. So, what are you worried about? Don’t be worried.” And true to His word, He’s been taking care of her always as He has been taking care of the rest of us. RS: Thank you for walking down memory lane and sharing such precious moments with us. Sai Ram. SN: Thank you and Sai Ram.